BuffetSeafood buffet is served only on Saturday night. 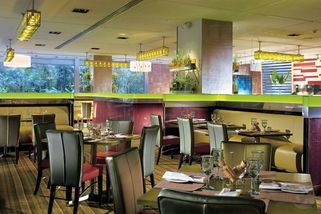 Lemon Garden Café offers buffet dining during lunch hours, and hosts and array of cuisines: modern Malaysian, Indian, Chinese, and Italian. They specialize in using only the freshest ingredients and spices. Thursdays and Saturdays, are Seafood Nights; enjoy the freshest catch of crabs, oysters, slipper lobsters, prawns and more. The fires are on in the barbeque pit each Friday, so get ready for hearty servings of chicken, lamb and beef. Lemon Garden Cafe @ Shangri-La Hotel Kuala Lumpur has no review yet. Submit a review!